The original ‘buoy band’, bound together by lifelong friendship and shared experience. For 30 years the Fisherman’s Friends have met on the Platt on the harbour in their native Port Isaac to sing the songs of the sea. A decade ago they were persuaded to sign the record deal that saw their album Port Isaac’s Fisherman’s Friends go Gold as they became the first ever traditional folk act to land a UK top ten album. Now the incredible true story of how that happened is told in Fisherman’s Friends. From the makers of the 2018’s hit ‘Finding Your Feet’, this new movie starring Daniel Mays, James Purefoy, Tuppence Middleton, Noel Clarke and directed by Chris Foggin is already tipped to be the feel good hit of the year. The film opens in UK cinemas on March 15th 2019. The Keep Hauling album contains 17 Sea Shanties , some old , some new and some slighty blue. 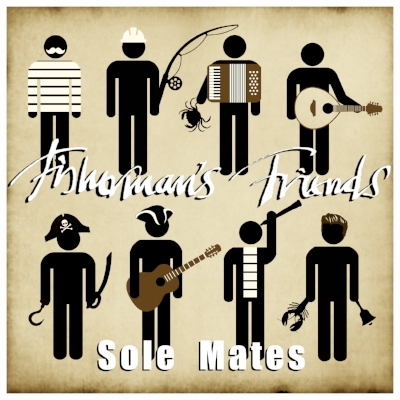 Sole Mates was produced by Giles Woolley & band member Toby Lobb. They looked to capture a sound closer to what audiences would hear at a live performance. Featuring 12 barn-storming tracks, Sole Mates has fast become a fan-favourite. Proper Job is the sixth offering from eight man strong Cornish shanty singers Fisherman’s Friends. Recorded at their favourite temporary studio - the parish church at nearby St Kew - and produced by the award-winning Rupert Christie, this album cements their standing as ambassadors, not only for their county and their village, but for the traditional songs handed down by generations of seafaring forefathers. The Fisherman's Friends fifth album was released months after the untimely loss of our dear friend and member Trevor and is a fitting tribute to him. Featuring songs such as 'Mary Anne' and 'The Last Leviathan', this album shows the diversity and range of the band as they move from barn-storming shanties to laments via the occasional contemporary tune. Well worth a listen. 'Port Isaac's Fisherman's Friends' was the buoys' 4th album, but the first to be produced after the band had signed a record deal with Universal Island Records. As such it saw a move away from the original a capella recording style to a more polished, produced feel and featuring instrumentation. It earned the band a Gold Certification for sales and reached Number 9 in the UK Album Charts. After winning the 2011 BBC Radio 2 Folk Awards, the album was repackaged with seven new songs from the sea.